Whisk is one lucky K9. His drug sniffing skills are valued to the point where the Lausanne police department has constructed a special cargo bike for him. Whisk is a lab retriever of two years, and he is considered a passive police dog. This means that he was trained to find illegal drugs on people by patrolling in public spaces. Once Whisk has sniffed out a suspicious smell, he will simply sit down to let his handler know. Since hustling from place to place can wear Whisk out, his handler had an ingenious idea: Why not transport him in a cargo bike? A canine cargo bike? "I had this idea while watching deliverymen pass by," the officer who handles Whisk has said. "My colleagues from the cycling brigade told me that we were not going fast enough for (drug) checks because we were getting around in a service vehicle, so I said why not try with a bicycle?" This solution would be environmentally friendly, innovative and most of all, time saving. With no such solution on the market, the Lausanne Police Department put their thinking caps on. 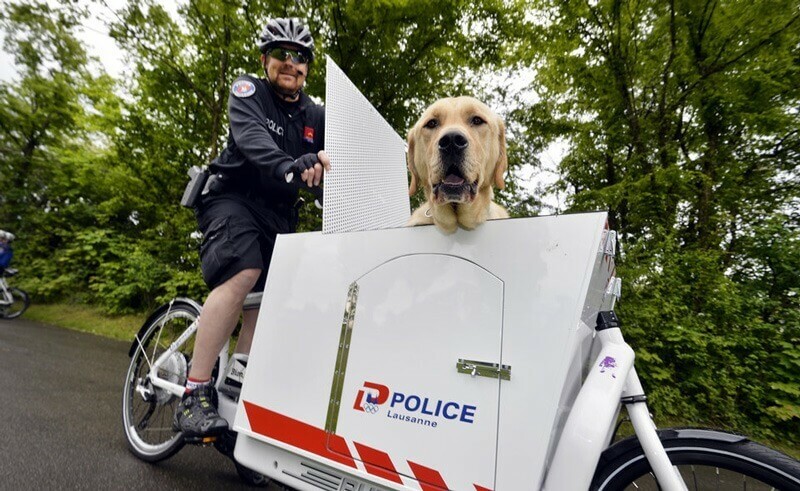 In coming up with Switzerland's first police dog bicycle, they were inspired by the cargo bikes commonly used for deliveries in Dutch cities. With this tailor made bike, the Lausanne patrol cops can now whisk their K9 to hotspots across town, such as the train station, the parks or the promenade along Lake Geneva. Whisk is loving the canine cargo bike so far: "Good weather is coming back, so Whisk will be driven in the bike more often - something he really likes," says Sébastien Jost from the Lausanne Police Department.